This compartment served as both a torpedo handling area and berthing space for 15 crewmen. 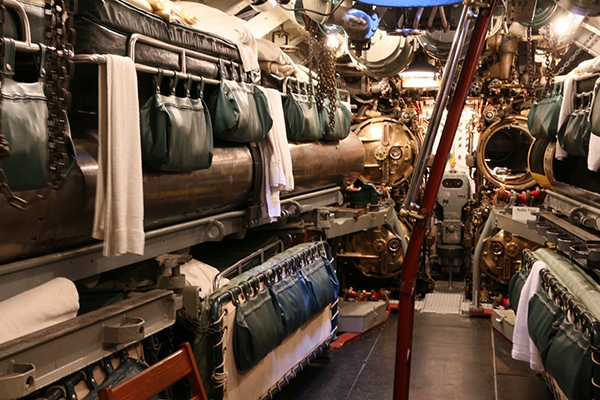 Most of the time Cod was at sea, the forward torpedo room was kept dark, lit by only a few red lights out of consideration for the sleeping crewmen. The forward and after torpedo rooms were the preferred sleeping quarters for the enlisted men because the rooms were not subject to through traffic and were both quieter and cooler than the main crew berthing compartment amidships (between the noisy mess deck and the hot, noisy engine rooms). 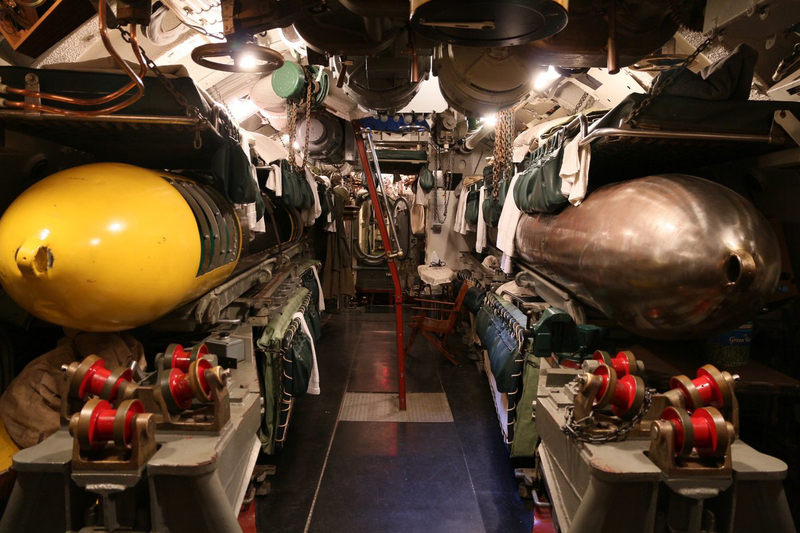 Most of the bunks in the torpedo rooms are mounted in the spaces between and above the stored torpedoes. Some of these bunks are on sliding rails so that they can be stowed out of the way while handling torpedoes. The bunk high above the deck in the after end of the compartment is called the "penthouse". Its occupant enjoys extra head room provided by the torpedo loading hatch. A fold-up sink, tiny shaving lockers, and personal crew lockers are also provided in the compartment. The large torpedo you see on the port side (left, facing forward) is a Mark 18 electric torpedo. It is more than 18 feet long, 21 inches in diameter, weighs approximately 3,000 pounds, and has a speed of 30 mph. The Mark 18 torpedo has a 600 pound warhead in the nose and can travel for a distance of approximately 2.5 miles. If it does not hit something it will then run out of power and sink to the bottom. It is powered by two large six volt batteries. These torpedoes do not leave a visible bubble exhaust wake as does the Mark 14 steam torpedo. The three torpedoes on the starboard side (two on the lower racks) are Mark 14 steam torpedoes (also called 'Whiteheads' after the inventor of the propulsion system, Robert Whitehead). The upper Mark 14 is a cut-away which reveals the intricate internal mechanisms that power and steer the torpedo. The fuel for the Mark 14 is a mixture of alcohol (the fuel), water (for steam), oil (for lubrication) and compressed air, (for oxygen). The exhaust products from the combustion process leave a visible wake in the water that is easily spotted by an alert enemy crew. In the cut-away you may notice that every rotating component has a matching component that turns in the opposite direction. This design prevents unbalanced torques (twisting forces) that would cause the running torpedo to be deflected from its course or alignment in the water. You will also notice that much of the forward portion of the center body is simply a large air flask for carrying the compressed air (3,000 psi) that provides the oxygen for combustion. This high pressure air is also used to spin up the torpedo's gyroscope as it is fired from the tube. Also used towards the end of WW-II were small sound guided torpedoes, called the Mark 27 Acoustic Homing Torpedo or "Cutie," that are designed for defending against an attack by an enemy surface ship. Cod's Mark 27 torpedo can be seen in the After Torpedo Room where it was located during her WW-II patrols. Anti-ship torpedoes in WW-II were aimed by setting an internal gyro system while in the ready-to-fire position inside a torpedo tube. Aiming information is transmitted from the Torpedo Data Computer (see TDC) located in the Conning Tower, and is dialed into the gyro system by means of a shaft or spindle that engages a square socket on the side of the torpedo. Because torpedoes can turn through more than 90 degrees after launching and because torpedoes can be launched from either end of the boat it is possible to shoot in any direction without changing the submarine's course. Unfortunately, this feature was responsible for the loss of some of our own submarines when the steering mechanism failed to stop the turn in the preset direction and the torpedoes continued in a 'circular run' striking the submarine that launched it. It is known that USS TANG, USS TULLIBEE, and possibly USS WAHOO, were sunk by their own circular running torpedoes. The Forward Torpedo Room has six torpedo tubes and the After Torpedo Room has four tubes. When leaving on war patrol the 10 tubes are each loaded with a torpedo and 14 more are stored on racks in the two torpedo rooms (10 forward and 4 aft) for a total of 24 torpedoes. Also located in the Forward Torpedo Room are the two active sonar heads which are deployed in the clear water a few feet below the submarine's bottom when at sea. Active sonar systems transmit an acoustic pulse which reflects from other objects in the water. The timing and direction of a reflected pulse determines the distance and bearing of the object. Human ears hear the transmitted pulse as a "ping" with the reflected pulse sounding like an echo. The hydraulic systems on either side of the watertight door leading to the Forward Battery Compartment raise and lower the sound heads as required and provide means for rotating them to obtain bearing information. The 'Head" or lavatory located in the Forward Torpedo Room was used by the officers who bunked in the following compartment and by crewmen who bunked in the forward torpedo room. Unlike the three other toilets aboard Cod that flush waste into a sanitary holding tank, the officer's head is an air-expulsion toilet which blows waste overboard with a 25-pound charge of air to compensate for sea pressure. If the occupant of the small compartment does not set all of the valves properly, he can expect an unpleasant surprise, often called "baptism" or "chocolate chips." The metal privacy door has been replaced by Plexiglas to provide visitors with a good view of the head.